1. Engage children with intellectual disabilities through developmentally appropriate play activities designed to foster physical, cognitive and social development. 2. 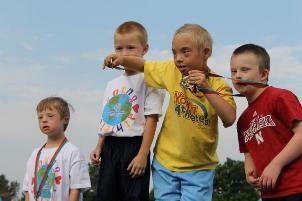 Welcome family members of children with intellectual disabilities to the Special Olympics network of support. 3. Raise awareness about the abilities of children with intellectual disabilities through inclusive peer participation, demonstrations and other events. Young Athletes is a versatile program that can work in various learning situations. The program is designed for families to play with their young athletes at home in a fun atmosphere. It is also appropriate for preschools, schools and playgroups to use with small groups of young children with and without intellectual disabilities. The flexibility of Young Athletes ensures the opportunity to welcome families and their young children into the Special Olympics family.